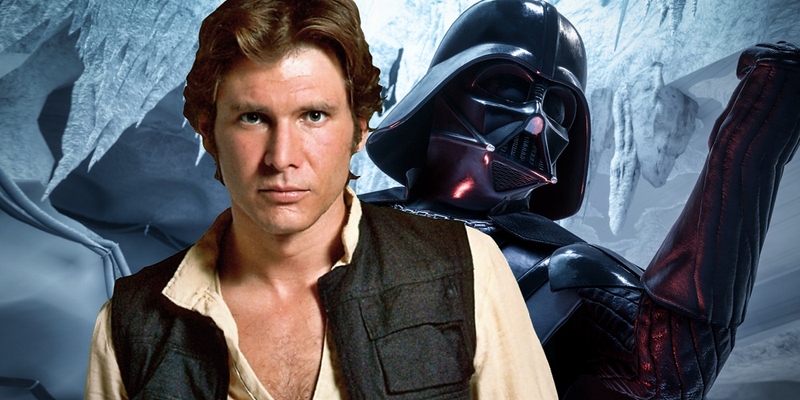 The latest Star Wars comic has confirmed it: Han Solo is a better space pilot than Darth Vader. Or, to quote Obi-Wan, it's true... "from a certain point of view." Marvel's Star Wars series has been fleshing out the saga's sequence of events placed (mostly) between A New Hope and Empire Strikes Back, when the Rebellion was solidified thanks to the best Star Wars battle in the movie storyline. It's that pivotal point in the series that Star Wars #52 uses as a backdrop, enacting the dogfight that never happened in the movies between Han Solo and Darth Vader. Against all odds, it's Han who comes out on top. It might seem a little unbelievable, but there's no disputing the issue: Anakin Skywalker/Darth Vader and Han Solo never got the chance to put their piloting skills to the test. They definitely came face-to-face and have been involved in the same space battles throughout the original series, with the Millennium Falcon and Vader's TIE Fighter both key players in the battle of the first Death Star. They certainly never get as close as they do in Star Wars #52, which is almost entirely a story of Han trying to survive against a bloodthirsty Vader. Adding a new piece of Star Wars canon is never easy. This is especially true with a piece of lore that is so widely accepted. For both Luke and Anakin Skywalker, being considered one of the best pilots in the universe is a defining characteristic. Han, meanwhile, is more known for his personality than his abilities. From the outset, it might seem blasphemous for Star Wars to suggest Han can possess any edge at all from inside even the Falcon's cockpit, if it's Vader on his tail. Yet Star Wars #52 finds a clever way around the argument of who is "better." Han does survive and evades Darth Vader, at a time when the Lord of the Sith wants nothing more than to blast him into bits. He just happens to do it the only way Han Solo does anything: using tricks, deception, and almost certainly some dumb luck. Han uses everything possible at his disposal, sending C-3p0 off in a shuttle to deliver a message (which cuts the droid in half), dodging missiles at the last second, and even using debris from a blown up Rebel ship as cover hide. It all works, with Han escaping Vader and managing to deliver the Rebellion's salvation at the same time. Sure, it's probably still debatable to name one of these pilots the "better" man (and Kylo Ren would almost certainly disagree). At one point in their chase, Han even admits to Chewie that there's no way they're going to actually be able to hit Darth Vader. And yes, if it was flying deathmatch, Han would probably lose. But that would be playing into Vader's strengths. And in a very technical sense, that would only prove that Vader is the best star fighter - not necessarily the best pilot. It's because of Han's skills behind the Falcon's control panel that he and the Rebellion survive for Empire Strikes Back. Whether it's in this one particular instance or overall, Han Solo can command his spaceship better than Darth Vader in pursuit. Star Wars #52 is available now from Marvel Comics.